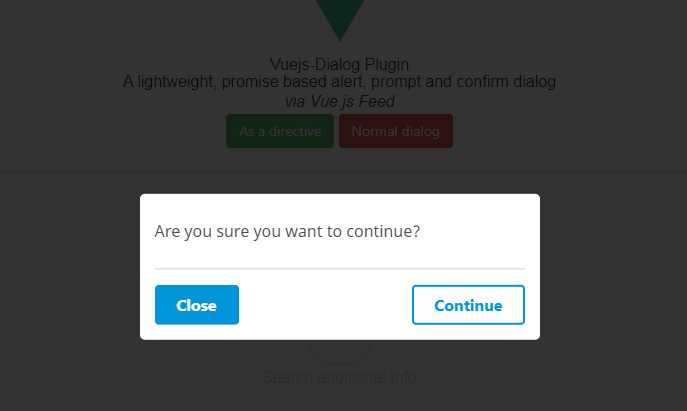 The Vue.js Dialog Plugin offers easy implementation of alerts, prompt and confirm dialogs, along with the option to be used as a directive. To start working with the Dialog Plugin use the following command to install it. The following example makes use of both the directive & method way. If you don't pass a message, the global/default message would be used instead. More options are available here, if you would like to do more with your dialogs, such as a loading Dialog - useful with ajax or a reversed Dialog. If you would like to explore more about Vuejs Dialog Plugin, head to the project's repository on GitHub, where you will also find the source code.